After Lincoln’s death, there was an immediate demand for items that mourned the late president. In Washington City, the whole town was draped in black mourning crepe. Citizens wore silk ribbons, pins, badges, armbands, and images of the fallen president. An industry of mourning goods was established overnight. 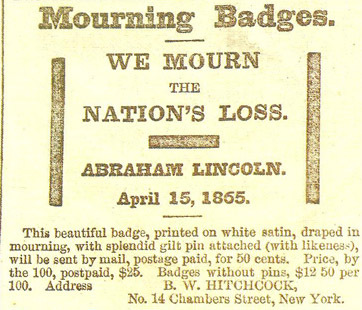 Harper's Weekly advertisement for Lincoln mourning badges. 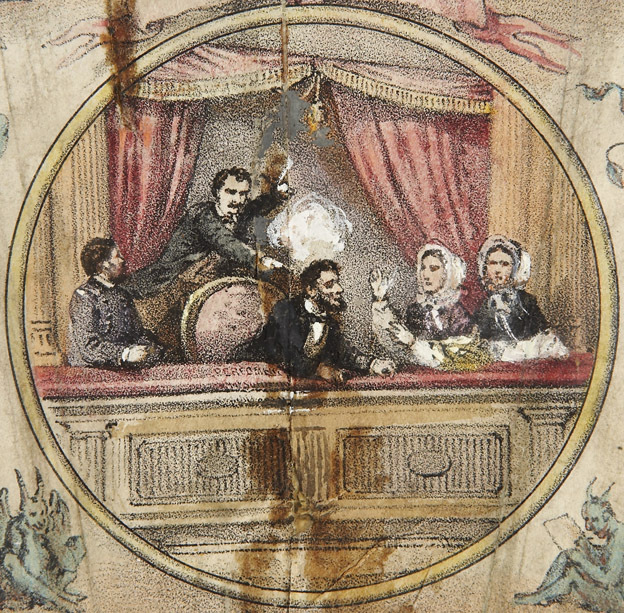 Booth, Mary Surratt, and other conspirators (one of which is probably Lewis Powell) conspiring to kill Lincoln. 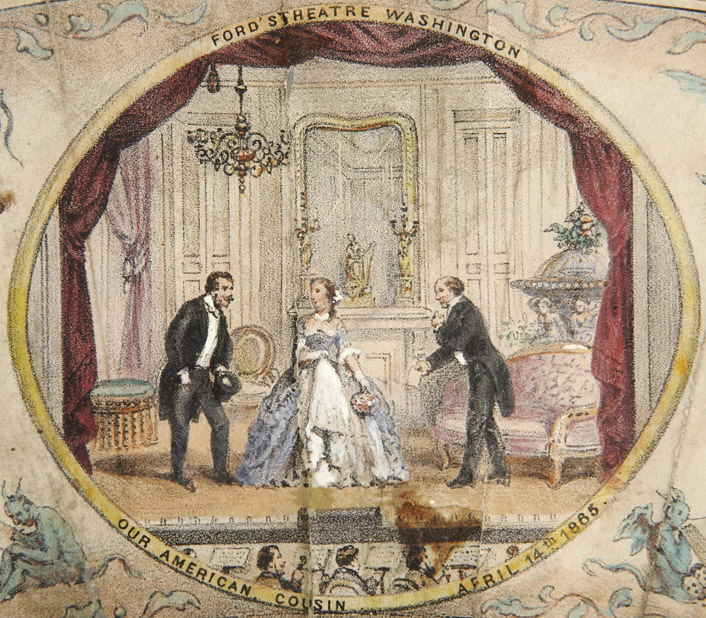 Laura Keene and others putting on the play Our American Cousin at Ford's Theatre right before the President is killed. 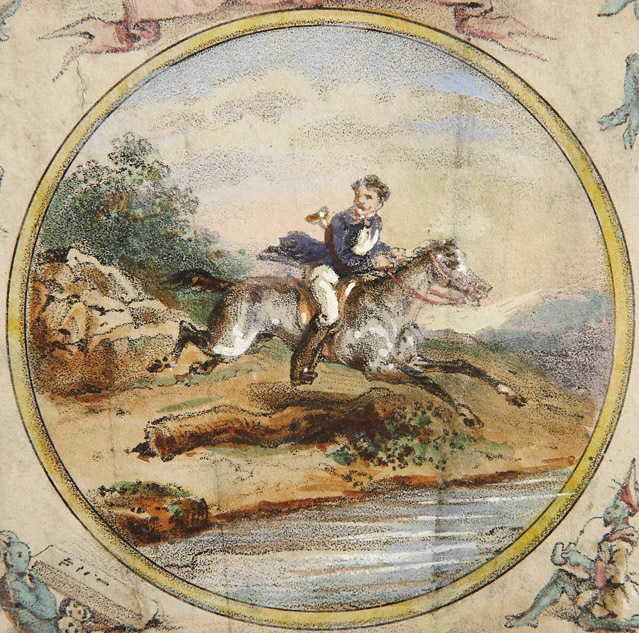 Booth makes his escape south on horseback. 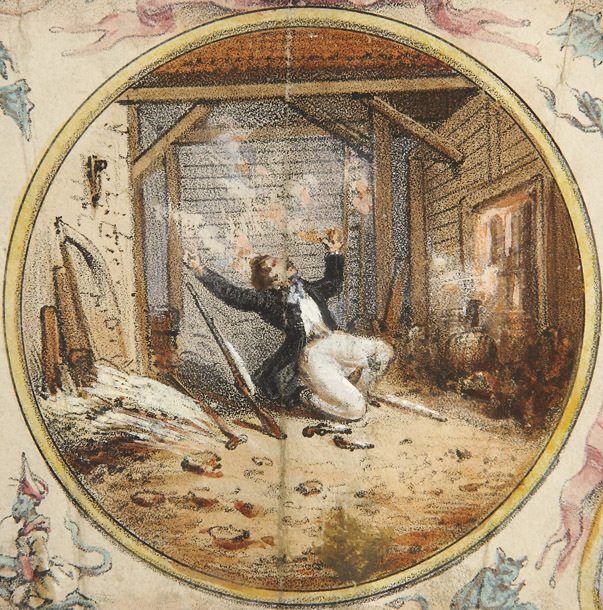 Cornered at Garrett's barn, Booth is shot and killed. The fan was designed to not only be a fashionable piece, but also a means of self protection and therefore holds two surprises in its design. In the base of one of the guards, there is a small, hinged area in which a lady could conceal poison. If this did not work, or, if the lady needed a more direct approach, the same fan guard houses a concealed knife that could be retracted and hidden from sight. 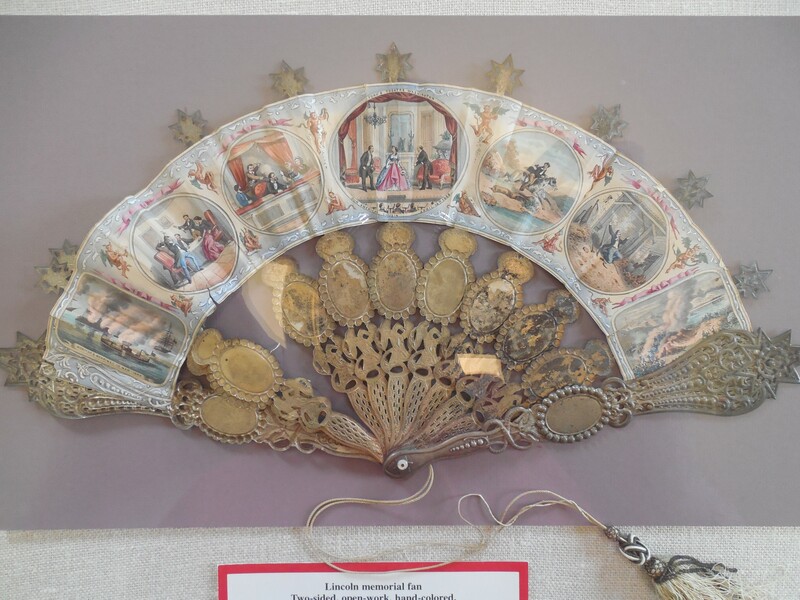 This fan had originally belonged to Father Robert Keesler, one of the original “Boothies”. A truly kind and generous man, he allowed the fan to be displayed at the Surratt House Museum as one of their centerpiece artifacts in their exhibit on Victorian mourning customs. 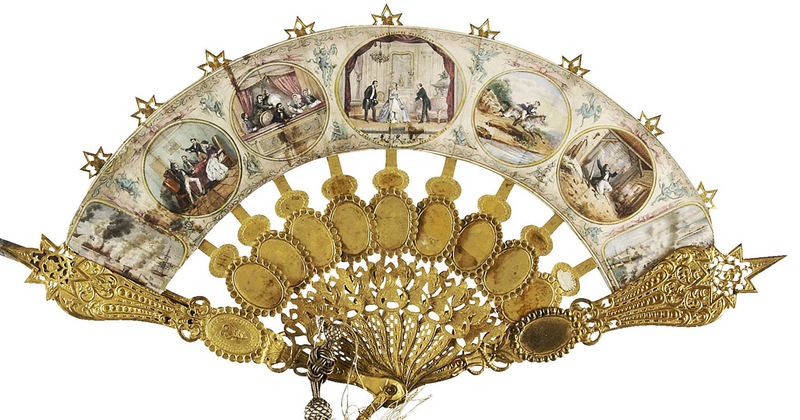 Father Keesler later gave this ornate fan as a present to Dr. John Lattimer, an esteemed Lincoln author and collector. 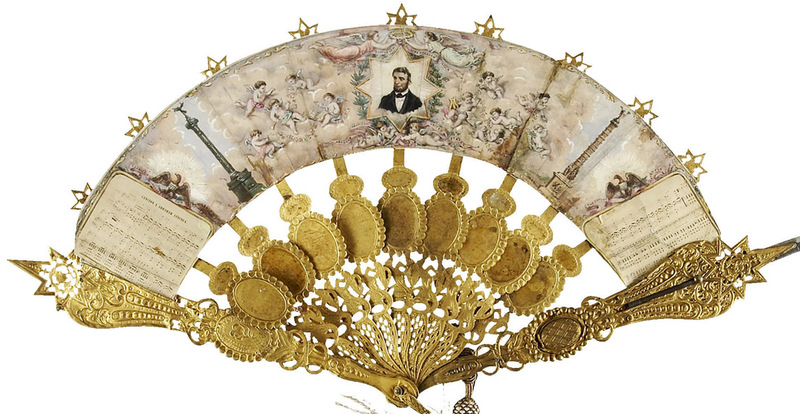 When part of Dr. Lattimer’s Lincoln collection was sold at auction in 2008, this fan went for $15,535. It was last in the possession of the Abraham Lincoln Book Shop in Chicago Illinois. They were asking $19,500 for this extraordinary piece of Lincoln mourning history. The image of the article regarding mourning badges comes from Lincoln’s Assassins: Their Trial and Execution by James Swanson and Daniel Weinberg. Several other mourning items can be found in this book. 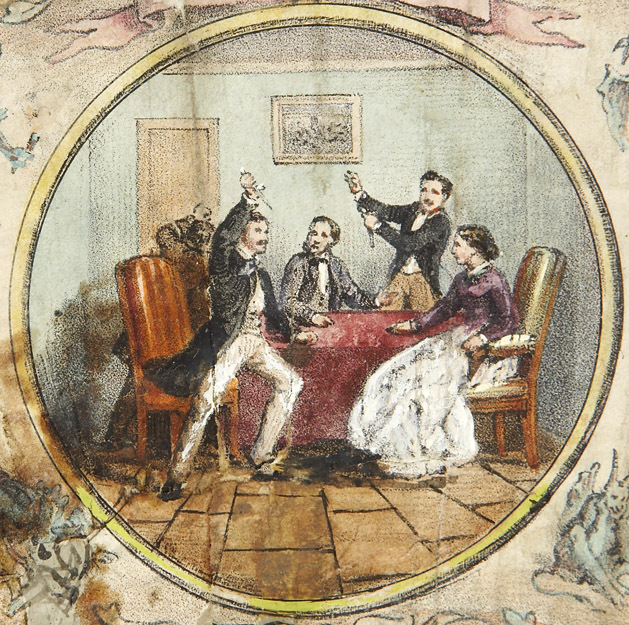 I would like to use the image from the fan of Our American Cousin for a production in London. Could you tell me if this image is in the public domain? I can’t find the fan on the Lincoln Bookshop website. Thanks! I got the images from the Heritage Auction page that sold the fan back in 2008 (http://historical.ha.com/itm/military-and-patriotic/civil-war/hand-painted-lincoln-mourning-fan-an-absolutely-stunning-lady-s-commemorative-fan-spreads-open-into-a-22-half-circle-fo/a/6014-61176.s). The fan was sold to the Abraham Lincoln Bookshop and they have most likely sold it since then. The only thing I can offer you is the following picture. It comes from a near identical fan that is currently on display at the trial room of the conspirators at Fort Lesley J McNair. It is not as high res as the auction images, but hopefully it will work for your purposes. I took the image myself and therefore I have the rights to it. You have my permission to use it for your production as long as you credit me (Dave Taylor) and my website (BoothieBarn.com).